William Butler Yeats (pronounced /ˈjeɪts/) was an Irish poet and dramatist, and one of the foremost figures of 20th century literature. A pillar of both the Irish and British literary establishments, in his later years Yeats served as an Irish Senator for two terms. He was a driving force behind the Irish Literary Revival, and along with Lady Gregory and Edward Martyn founded the Abbey Theatre, serving as its chief during its early years. In 1923 he was awarded the Nobel Prize in Literature for what the Nobel Committee described as "inspired poetry, which in a highly artistic form gives expression to the spirit of a whole nation." He was the first Irishman so honored. Yeats is generally considered one of the few writers who completed their William Butler Yeats (pronounced /ˈjeɪts/) was an Irish poet and dramatist, and one of the foremost figures of 20th century literature. A pillar of both the Irish and British literary establishments, in his later years Yeats served as an Irish Senator for two terms. He was a driving force behind the Irish Literary Revival, and along with Lady Gregory and Edward Martyn founded the Abbey Theatre, serving as its chief during its early years. In 1923 he was awarded the Nobel Prize in Literature for what the Nobel Committee described as "inspired poetry, which in a highly artistic form gives expression to the spirit of a whole nation." He was the first Irishman so honored. 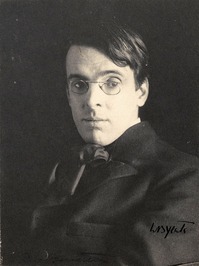 Yeats is generally considered one of the few writers who completed their greatest works after being awarded the Nobel Prize; such works include The Tower (1928) and The Winding Stair and Other Poems (1929).